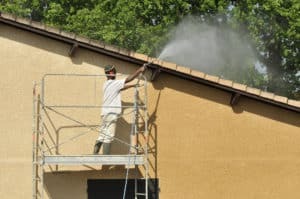 8 Pressure Washing Tips You Need to Hear - Pro Wash LLC. Pressure washers can be fun to use and show amazing results. If the outside of your house or business needs a good washing, it might be time to break one out. It’s the fastest and easiest way to clean but there are a lot of things that you will need to go before you decide to go that route. Check out these eight pressure washing tips before you get started on your cleaning job. Hiring a professional is a good idea if you’re cleaning your entire home. If you’re cleaning a tiny section of your home, then renting is the way to go. Do your research and get quotes from several different companies. Professional pressure washers may charge $800 or more to clean your entire home depending on the size. If it’s a smaller job, and you would still rather hire professionals then it might run you about $200. Renting a power washer might cost you about $60 a day. If you think it would be a good idea to buy one, it will be a hefty investment of around $100 – $300. The decision to rent or buy depends on how often you think you’ll be using it. You can measure a pressure washer’s strength in a couple of ways. Pounds per square inch or strength of outflow and gallons per minute or volume of the water. Most machines have three to five tips that you can choose between. For most jobs, twenty-five to fifty feet of high-pressure hose will be more than enough. Before you get started it’s best to get everything out of the way. In the case of washing a concrete porch or a deck, you should sweep everything off of it first. You will have way better results if you get all the dirt and debris off the porch before you pressure wash. If you have any patio furniture you will want to remove it to avoid damage. If you’re cleaning the side of the house make sure to cover all the light fixtures with plastic bags. Cut back any shrubs that have grown around the side of the house, and it goes without saying to turn the electricity off at your breaker box. Pressure washers are not only potent but very powerful. Never point it at another person. Make sure you take protective precautions when using one. Wear work boots or shoes. The power of the spray can cut your skin and even tear through light shoes. Never spray it at windows or electrical outlets. Don’t pressure wash your roof because it can damage shingles. Never spray air conditioning condenser coils. They are very delicate and the pressure washer could damage them. Follow all the instructions in the manual to the letter. It will have the best pressure washing tips that you could ever get. It will tell you everything you need to know, from what power and hose tip to use, to what to wash and what not to wash. Always follow the instructions so you don’t break things you can’t replace or that will be expensive to replace. Reading the instruction manual will also stop you from hurting yourself and others. We’ve talked a lot about different pressure and tip selections. The reason is that the washers are so versatile. They can come with many different power selection and tips styles. Each one of the tips has a different use depending on what you’re washing. For example, because wood is so delicate, you want to use the lowest pressure setting available and if you have an option to sue a fan tip, you would use that one on the wood. Test your pressure and tip on a small bit of the surface that you’re cleaning first to see if it’s going to cause any damage. Agan, you will use a fan tip for something like a wood deck. They come in a variety of sizes, a forty to sixty-degree tip size is the norm for deck cleaning. You will hold it about 12 ft off the surface of the deck and clean it using a sweeping motion. After a bit, your arm may become tired and you will have the temptation to drop your arm a little. Try to resist this and keep a constant distance away from the deck. When you’re washing a wooden deck, sometimes it will etch and peel. You want to avoid this, but sometimes it happens even when you go as gentle as you can. This is especially horrible when you wash a wood railing and that chips. Splinters can be killer on the hands. You have a couple of options to save your deck when chips happen. If you go easy on the deck and do minimal damage, you can sand the wood back down and then throw some sealer on it. If the wood looks dingy after you fix it up, you can also restain it. This will actually leave the surface of your wood very smooth. Using a pressure washer can be the easiest and fastest way to clean off your deck or house. Follow these handy pressure washing tips, and if all else fails make sure you consult your manual. It’s there for a reason. If you have a home or business that needs a deep cleaning, a professional power-washing company is the way to go. Here at ProWash LLC, we’ve served the greater Nashville area since 2011. We only use the best equipment to ensure the job gets done right. If you would like to schedule an appointment or talk to someone about our services, contact us today!